Less than five minutes into The Muppet Movie, Dom Deluise flashes a knowing grin and delivers a completely filthy joke. Playing a Hollywood agent lost in Kermit the Frog's swamp, Deluise shows Jim Henson's famous fly-eating puppet an ad for Worldwide Studios announcing open auditions for frogs wishing to become rich and famous. "If you get your tongue fixed, who knows," Deluise says. "You could make millions of people happy." They say, getting there is half the fun. 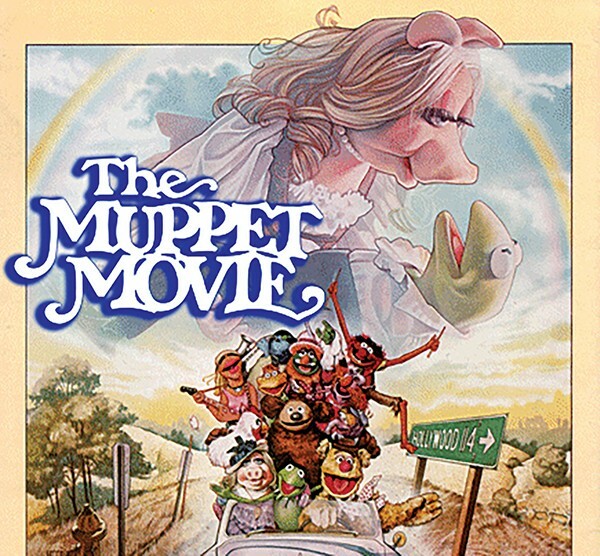 But when we're talking about The Muppet Movie, getting there is everything. Jim Henson's 1999 film functions as an origin story for the beloved puppet troupe, a buddy picture about a frog and a bear seeing America, and a loving satire of all things show-biz. It's also a never-ending stream of celebrity cameos and groan-inducing one-liners. In addition to Deluise, the parade of 1970s-era superstars includes Richard Pryor, James Coburn, Madeline Kahn, Telly Savalas, Carol Kane, Paul Williams, Milton Berle, Mel Brooks, Steve Martin, Orson Welles, and a big yellow bird on his way to New York to make it big in public television. The collection of one-liners is even more impressive, and it starts right out of the gate when Muppet critic Statler notes that he and his companion will be attending a "private" screening. "Yeah," his companion Waldorf answers. "They're afraid to show it in public." Contrary to Waldorf's opinion The Muppet Movie will be screened in public December 26th-31st on Pink Palace's big screen. Come for the stars. Stay for the "Wokka, wokka, wokka!"